Whether you see the increased intensity and frequency of these monster storms as mother nature or man’s interference in mother nature it is pertinent that you see your hurricane relief packages might be making matters worse. We write this not to get you to get off your you know what but because we were fielding questions on what and where to send donations. Florida Governor Rick Scott was right when he said, “we can rebuild your home, but we cannot rebuild your life.” We hope that your families are and stay safe from harm and this can help to reframe your ideas about donations and truly put them to work. We’re in the estate sale business but we’re really in the business of recycling. We re-home what our clients no longer need. 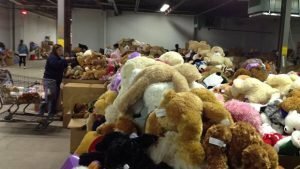 It’s those things you no longer need like clothes, shoes and toys that end up being donated in the wake of a natural disaster like Hurricane Harvey or Hurricane Irma. The problem Juanita Rilling, former director of the Center for International Disaster Information in D.C., points out is that well meant donations can bog down humanitarian relief. 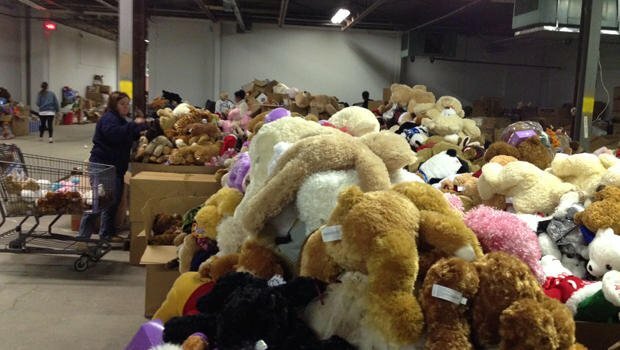 The teddy bears shown above are donations that amassed after the school shooting in Newtown, CT. 67,000 bears bears arrived in Newtown, every child was given a few, and a warehouse house had to be rented to store the remainder until they could be taken away. It feels good to make a donation so make sure yours isn’t one that donates to the problem. Stop sending clothes. After the 2004 tsunami a mountain of used clothing amassed on the beach. Before the workers could clean and separate useful items the mound quickly rotted. The pile was set aflame and washed out to sea. Don’t send water. Send your money to organizations with portable water purification units instead. Check the internet for wish lists. If you need to send something tangible do your homework. In 2012 organizers of Occupy Sandy launched a “relief supply” registry to get the word out about what was needed. Send money. Beware of scams by checking sites like charitynavigator.org before sending your hard earned money. Cantor Fitzerland Relief Fund opened a fund to give 100% of what they collect in direct financial aid to hurricane victims. Fuel Relief Fund is providing free fuel to individuals so they can access food, water and shelter. Donate blood. Donating blood or platelets is something we should all do but now more than ever. Did you know that Houston, the fourth largest metro area in the country hasn’t collected blood in the past two weeks (and for weeks to come). Find your local blood drive at the American Red Cross. Foster a pet. 100,000 homes were damaged or destroyed in Houston. 44% of those that refused to evacuate did so because of their pets. Organisations like Wings of Rescue are helping by relocating animals that were already sheltered in effected areas so the newly displaced pets have somewhere to land. Just hours ago, during the season opener of the New England Patriots, all five living Presidents united to announce One America Appeal. Donated funds will be allocated to Hurricane Harvey and Irma relief. This joint venture is historical, lets make history with them. Don’t hesitate to call if you have questions about how to make your donations really work, 617-817-1178.